I can't believe it's already August and I have not yet specifically blogged about my garden. The truth is, I didn't plant that much. But the things I've planted have done well. Kale and lettuce, peas, yellow summer squash and radishes (to battle the bugs), cucumbers and an assortment of tomatoes. I have been rather busy canning. 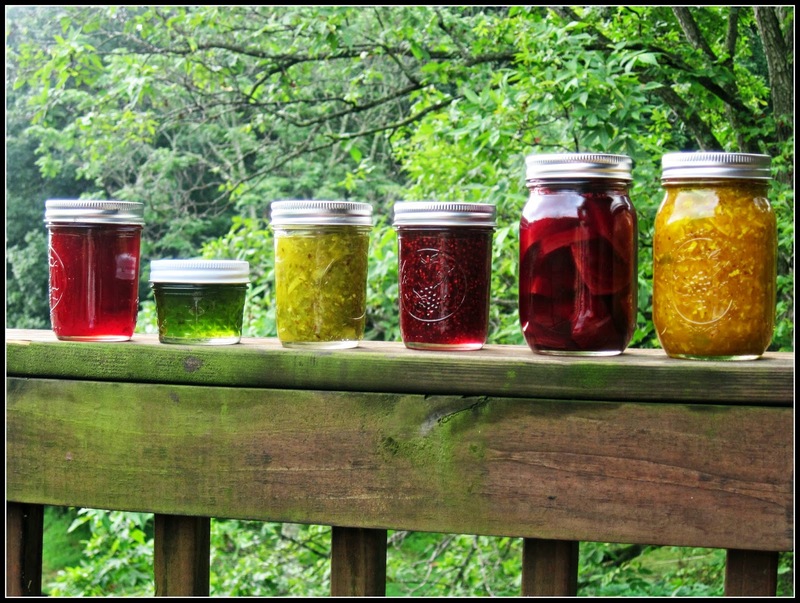 Below you can see (from left to right) strawberry jam (from our strawberry picking), jalapeno jelly, dill relish, wineberry jam (these grow wild on our land), pickled beets (thanks to a big batch of beets from Sunnybrook Farm), and sweet summer squash relish. I've also done a number of squash pies for the freezer and some squash refrigerator pickles. I plan to plant a few crops for the fall. Beets, spinach, lettuce, and maybe some more peas. These are all things that tend to do well in the fall in my garden. Broccoli does well too, but picking off all those caterpillars kind of gets to me after a while. Readers, what's growing in your garden this summer? Mostly weeds in the garden this year; the cool temperatures have not been at all conducive to successful ripening. Even my peas are only half grown! They look good, glad that you could use the beets, they look so nice canned like that. We have been eating the wine berry jam (just had some on toast for breakfast) and the dill relish is perfect for hot dogs. Glad that we could do a swap, this rain will be good for the garden. wow, those beets. my next door neighbor as a kid got me into liking beets. yummy!! so delicious. curious - what do you use the spinach (i am guessing that is tiny green jar?) jar for? is that like a spread? are these family recipes? so fun!! Bt is an organic for cole crops to keep the caterpillars at bay, you can eat the same day. COngrats on a great harvest. My thumbs are still brown tinged, even though I did win the battle against the grape fungus! The summer squash relish sounds interesting..does it have sugar in it? i like your rainbow! good for you! Je bent wel heel goed bezig geweest, dat word weer smullen. Wow--you have a great group of fresh veggies --and you'll enjoy them all winter!!! That is SO neat..
Jalapeno jelly and dill relish, sounds so interesting! I have never known about it before. How about the taste of the jelly and the relish. I really want to know. Such a pretty array of the fruits of your labor! Hmmmm, jalapeño jelly? We've had a good crop of jalapeño peppers. Wonder if I could make that? Our tomatoes didn't do well. Our cucumbers and lettuce did well. I hope to plant some more lettuce for this fall. wowzer!! those jars look magical! Isn't it funny how our plans change? Love your rainbow! Everything sounds so yummy....enjoy. A rainbow of goodies indeed! My garden is done and I just covered the dirt hoping to keep the weeds at bay. I start again in October. Enjoy! I cannot believe how much you are able to do!!! I guess it is your running. Did I tell you that the boys are SOOO much cuter in person? I know that has nothing to do with canning, but still..
That is a beautiful lineup! I will have to consider squash pickles this year. I need a garden! Yours is so pretty! Lisa, you are making me look bad with all your canning accomplishments! We have tomatoes (all still GREEN!!!).. green beans, peppers, yellow squash, zucchini, basil, parsley, onions, garlic, pathetic corn, blackberries and raspberries. Your jars of goodies look great!! This all looks so good to me. LOVE pickled beets! Woooww! Your garden is a rainbow of goodies indeed, I agree! We don't grow anything in our apartment, apart from plants. We'd surely love to have a farm. One more month to go, and the Summer will be over. Enjoy August! You must be a happy lady, Lisa. Our garden is not doing very good at all! Well we do have blueberrys! You really do have a rainbow! That is, indeed, a colourful collection of good things for your pantry. I'm not very good at growing things. And useless at preserving them. Weeds, yes. Milkweed, a Monarch caterpillar (just one), asparagus, otherwise my veggies pretty much failed. I'm very happy to see yours, though! sigh. As a single guy in a condo, only three plants arranged in clay pots baked in a kiln with cool purple exteriors that are set inside small antique wooden crates! This is a great post that reminded me that my parents boiled and canned red and green peppers for the Winter in Ball jars, in our basement! A nice memory for me!! My little test garden plot was a bust. A big rain came and washed all the black potting soil and the seeds out of the boxes. I like your harvest. We did not do a garden this year which is nice and disappointing--the latter when we don't have any fresh fixings for the nightly salad. Fortunately, our friend has given us lots of zucchini which the Mrs. turns into zucchini muffins--a popular treat enjoyed by all here. My husband grew a lot of things. I should can. So far I've been chopping, and freezing. Sunnybrook Farm had beets? Oooh, would have loved some! Someday when I am successful and live with a house that actually has a yard...loving all those colors.